Behaviors are simple bits of logic that can be added to your game objects, and linked together to create unique and sophisticated game mechanics. No programming experience is required to get started. 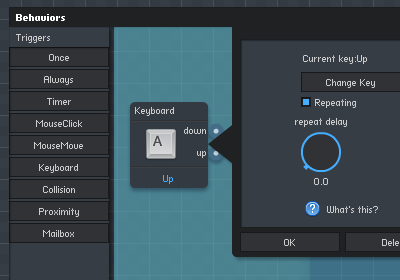 To start adding behaviors to an object, click on any game object and select "Edit" to open that object's edit panel. 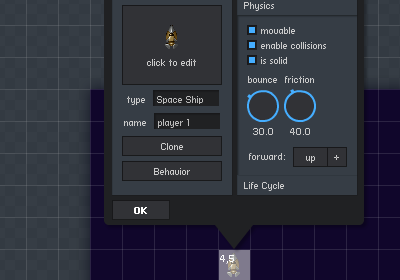 Click on the "Behavior" button to open the behavior editor. Note: in each behavior's properties panel there is a What's This icon that will open up information on that behavior when clicked. Behaviors can be linked together to build sophisticated game logic and interactions. Each behavior has a set of Ports on its left and right sides. Ports on the left side are input ports, and ports on the right side are output ports. To add a link between two behaviors, click on an output port, and drag a link to another behavior's input port. The link will turn green when it connects properly and can be released. When there is a link you no longer want, just click on it to delete. Whenever a behavior is triggered, it will send a message on its output links, triggering any behaviors it is connected to. In the picture to the left there is a Once trigger behavior, which fires once when the game starts. 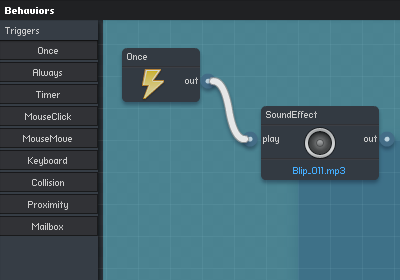 The Once behavior's output is connected to a Sound Effect behavior's input, This means that when this game starts, the sound effect will be played one time. The sound effect's output isn't linked to any other behaviors, but if it was, they would be triggered after the sound effect is played. Triggers are behaviors that are initiated by events occuring as the game is being played, such as key presses or object collisions. These trigger behaviors will in turn trigger other behaviors that make up your game logic. Logic & Math behaviors are for performing arithmetic and controlling the flow of your logic. Components are behaviors that perform a specialized task, such as playing a sound or adding a force to the object. Properties allow access to directly update or extract the properties of a game object. GUI behaviors are user interface widgets such as windows and labels. Game Flow behaviors affect the flow of the game, and are used to restart or pause the game, or change levels.